So will they combine last week's UE sales in to next week's chart? Or are they forever lost as far as the weekly PAL chart is concerned? That could make SOD2's performance look pretty bad next week given most sales are likely to be last week with the UE. And why aren't they counted? They will be counted next week. The game's official release date has not happened yet, so all the UE sales are classed as paid-for pre-orders. OK, didn't realise this was a thing. Yeah, every region handles it differently. Like Germany I believe was always at the period it sells, so you occasionally saw big games creep into the chart the week before if there were street date breakages. The switch install base today with over 15M users + Zelda hype + Wii U ports having proven to be more successful on Switch. Honestly I don't think its that complicated. Most of it is just a push back towards the hype. But some genuinely don't think it's a good value or just another nintendo gimmick to sell plastic or in this case cardboard. So those happy it failed feel just as justified as those of you who stand against "aggressive monetization" in other games. The latest big release of today's most hype console. God, the UK market is so small. Honestly I don't think its that complicated. Most of it is just a push back towards the hype. But some genuinely don't think it's a good value or just another nintendo gimmick to sell plastic or in this case cardboard. The product largely reviewed well and those that purchased it seem to think it's a good product. It's not aimed at traditional gamers but that doesn't make the product itself poor or a gimmick. Hence why I find that desire to see it fail so strange. So those happy it failed feel just as justified as those of you who stand against "aggressive monetization" in other games. I said I understand people's emotional reaction to aggressive monetization (not that its something I actually care about, I don't, companies can monetize their products however they want) but if the ultimate reason people hate Labo is "its a gimmick not targeted to me", that's ultra petty. You think this is only in the UK? What do you think the difference is between spot 27 and 25 in any other country? Do we have numbers to even confirm this? Or it's pure speculation? Confirm what? That once you’re outside top20 in any country the numbers are comical small? Japan doesn’t even seem to track or at least show numbers of games outside top20. Edit: I guess Famitsu might. It's pretty standard everywhere, especially in slow parts of the year like now, pretty much everything outside the top 10 isn't really selling all that well, nevermind if it's in the 20s, it's probably only just about breaking the 1k mark at this time of year. Which countries have bigger game sales? America, China, Japan? in Europe I could only see Germany being bigger. The difference between two spots outside the top 10. Sounds like you're speculating. Unless you have numbers to share? 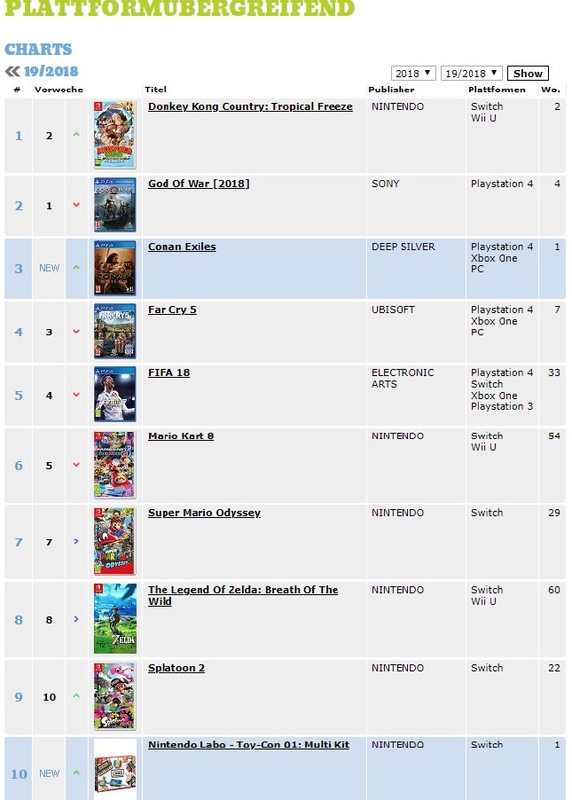 Famitsu and Dengeki charts go past the top 20 (Dengeki ones aren't linked to the first-page on new threads thou). Most people this time of the year are playing games they already have, Fortnite and so on, plus Digital etc. This are slow months across the board. Numbers are Dengeki. So yeah, exactly 100 units difference between 25 and 27 in Japan last week (though it should be noted that last week was probably the slowest week of the year for Japan, the week after Golden Week). We were talking about 25-> 27. I don’t have any numbers I’m not an insider, but just compare it to Japan (a bigger market) the difference between 25 and 27 during week 19 was 41 copies. Yeah i don't get it, it's not even a major title, the fact FE sold a million despite a lot of people predicting it had underperformed makes commenting on whether the third release of this musou did poorly in one market not too meaningful. We'll find out how well it actually did in KT next quarterly reports. Personally though I wouldn't have predicted a better performance than the wii u version. There's already 2 versions a prospect buyer could have bought long before this version released. As far as KT is concerned this is just extra profits. Ha, that's great. I can hear the music in my head, because I just happened to watch that clip a few days ago (the original, I mean). Topping FIFA in the Euro market is pretty darned impressive. How is HW even a big release?